​Wow! LOW LOW prices online: Try Expedia, Orbitz, Kayak, Hotwire, Priceline, or even the US or International rental car company's own site! Parklands sees lots of clients who get the cheap rates online on their own. Their first experience on arrival in Costa Rica is often finding they got a lemon of a deal. Parklands' team is angry with the unfair charges innocent visitors are faced without any reasonable prior communication of it. We are against unethical gauging and bait and switching. But what's hardest for Parklands' travel planning staff is to help clients understand, so it's best left to authentic reviews of real experiences with real rental companies in Costa Rica. Parklands is well connected with local honest rental car companies and demand they give you only good value and honest quotes with all the mandatory charges detailed. We never want you paying unfair charges that you never booked and planned. It's always your opportunity to decide! It seems a complete disconnect between honest guaranteed quotes from reputable local companies and what is so cheaply advertised online at the big name websites, online quotes so far from being even an estimate. We can only expect to keep seeing more sad and shocking reviews of these repeated vehicle rental problems that tourists and executives have with many rental companies in Costa Rica. Parklands cares, honors, respects and welcomes visitors to beautiful Costa Rica! The following reviews are the complete responsibility of the author and the original website where they appear. "Rental-car insurance is still a national tourism scandal: Expedia Inc.’s Carrentals.com booked me a rental for $157 a week. When I arrived to pick up the Toyota Yaris, Thrifty Car Rental charged me another $244 in insurance alone for a total of $401. When I complained to both companies, they defended their fine print tactics. I don’t recommend either company for Costa Rica." Told one price then arrived to find another! We were told one price and when we arived we were told a much higher price for the rental because thay were out of the car that we had ordered and thay would not use the insurance coverage that our MasterCard would cover. I have been to Costa Rica more than five times, but I would avoid Avis and never use this agency again! ... We asked to see the previous records on the vehicle and they found one with no marks to indicate dents even though the car clearly had other dents on it. Some were marked when we picked up the car...just not the one we pointed out. It is a scam. If you rent from them please make sure you take the initiative to mark everything you see no matter now minor it may seem. If at all possible, avoid Avis like the plague. They are slimy and corrupt." "I have never been treated so badly!" "We rented a car for 12 days for a fee of $486 which I agreed to. They would not let us leave without signing for TWO different insurance which brought the total to over $1100. I asked to see the rates in writing that they could not produce. I also asked to read their insurance policy which they also could not produce. Even though my insurance covers all rentals they still would not give me the car. After an hour of "negotiating," we finally left with the car and a bill of over $750. Caveat Emptor!" 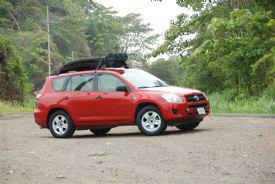 "I strongly recommend not renting from Avis... My husband and I booked a car through Avis months before arriving in Costa Rica. When we arrived they did not have the vehicle we requested as well as nothing comparable in size. They then said that we could rent one of their smaller SUVs, at a higher price (over $500 more than what they quoted us for the larger SUV). When my husband showed them the conformation they had emailed us, the man working there said " you have to understand you are in Costa Rica now." Long story short, we left without renting a car. I can see how this little scam might work on travellers who don't speak Spanish, or do not have someone with them to drive them elsewhere. "Was forced to pay a significant surcharge"
"My rate quote was honored except then I had to pay a significant amount of money for insurance which was not factored into the rate quote. Also, eventhough I had a reservation with Economy, I still had to wait 2 HOURS until a car was available!" "Dollar Rent A Car Takes You To The Bank"
"Rented a Luxury Pathfinder (or similar) and got a piece of garbage SUV. It was trashed. Argued and it got us nowhere. Rental was $375 and insurance, taxes were $600...... DO NOT rent from Dollar!!!" "All car rental websites serving Costa Rica are guilty!" "Scam! Confirmation from Website not honored on arrival!" "I was quoted $278 online, then paid $600 at the counter!" A Parklands lodging guest booked an older model compact sedan from a major rental company here for a low advertised $278 per week rate including tax. It was only at the car rental counter on arrival that she was told about a $12 per day mandatory/compulsory insurance. Now her bargain week rate had gone to $362. But the story continues. This name brand car company went on to scare our client about Costa Rica driving, and felt cooerced into taking out full insurance for peace of mind. In the end she was billed $600 for the 6-day rental, and the car rental didn't include any complimentary free extras like GPS unit, CR Cell Phone or extra driver. Auto insurance in Costa Rica is a government monopoly of the INS (Instituto Nacional de Seguros). Liability insurance from the INS is mandated by law, but provides only minimal coverage. Rental agencies offer supplemental programs that cover deductibles and contingencies other than a simple traffic accident. Required by Law--TPL, SLI, SLC or API—Liability Insurance from the INS is required regardless of your policies at home or the claims of your titanium credit card. The cost ranges from $US 7-20 per day depending on the vehicle. This insurace does not cover your rental car at all, only damages to other people, their cars, or property. Unless you purchase supplements, or have documented coverage from your credit card you are still responsible for all damages to the rental vehicle. Collision Damage Waivers are a supplement underwritten by the rental company to reduce your liability for your rental car to the deductable amount ($US 1,000-3,000 depending on the company and vehicle) only in the case of an accident. The cost ranges from US$ 12-25 per day depending on the company and vehicle. You are still responsible for all losses or damagesin the case of negligence, vandalism, road damage, or theft. This insurance may be replaced by your home auto insurance policy or credit card coverage. Check before you rent, and get it in writing. Some credit card companies have exclusions specifically against Latin American rentals. Some rental companies do not allow you to waive this insurance regardless of other coverage. They are noted in the rate table. Under the names of Full Coverage, Vandalism Supplement, Damage Supplement, and Theft Insurance these extra policies are intended to reduce your liability to zero when combined with SLI and CDW. For example, if the trunk is damaged by thieves while they steal your luggage you will be held resposible for the damage unless you have purchased a third level of insurance. The cost ranges from $US 5-20 per day depending on the fine print and vehicle. These insurances may be replaced by your home auto insurance policy or credit card coverage. Check before you leave home, and get it in writing. Some credit card companies have exclusions specifically against Latin American rentals.